No, it’s not you; modern art is not art. It is anti-art, the aim of which is to obliterate beauty. I’ve been watching this classic bit of TV, written and presented by the great conservative philosopher Roger Scruton. It’s hard to believe that the BBC aired it. Their cultural gauleiters would certainly blackball Scruton’s masterpiece today. Police have sealed off 1,300 of 2,315 schools in Catalonia designated as polling stations for the region’s banned independence referendum, Spain’s central government says. The move came as the Spanish authorities stepped up their attempts to stop Sunday’s referendum. Police have now occupied the regional government’s telecommunications centre. They have been ordered to clear schools occupied by activists aiming to ensure the buildings can be used for voting. Many of those inside the schools are parents and their children, who remained in the buildings after the end of lessons on Friday. It seems to me that Madrid has been quite heavy-handed. This is strange because it’s the one thing guaranteed to foment anti-Madrid resistance in Catalonia. I have no idea what will happen tomorrow. The polls I saw a couple of weeks ago had the No (to independence) vote ahead by some 6 – 8 points. If accurate, that can be turned around. Either Catalans don’t want independence, which is fine by Madrid, or they do want independence, which is something that cannot be denied long term. History shows that the aggregate of national opinion will prevail eventually. Either way, I can’t see sense in Madrid’s hostility to a referendum. Catalans will be independent, if they want it, so better to ask them sooner and get on with it. For 30yrs he’s been Number 1. Love him, hate him it can’t be denied that he speaks for one of the largest audiences in the world. He has done so for three decades. At the beginning there was ABC, CBS, NBC, and CNN, and HIM. Now there are many more voices, he single handily brought AM Radio back to life. He did so with an honest, straight forward dose of reality from the angle of the common American. Now he is not common, no one can reign for as long as he has and be viewed as common. What he does though is say what tens of millions of us feel and believe. His analysis is second to none. Take the time, the following two videos combined are a little more than a half hour. The interviews cover several topics, take the time and see why he has held the largest single audience for 30yrs. Think about that, most of what you hear about him is bile and hate. If he was really that hated, or was a voice of reason that reflected the majority of America would he really hold a loyal base of over 25 million people a week for 30yrs straight? The slow, inevitable death of Labour as it used to be. I have always had a deep, not admiration, more a respect for the old time Labour Party. It was peopled with men of integrity, men of substance. If an opponent, one could always rely on the stances of the Party, of the leaders, never bending to suit the prevailing winds, never to sacrifice their principles for cheap political advantage. I used to live in a mining village, many of my friends had parents who worked in the mines; and one had to observe that the men who came from the underground into daylight were the true salt of the earth. I too have worked underground, and, I suppose, that experience gave me more understanding of people who took the Labour ideal; than many a news article, political speech or ‘vision’ from some ‘special advisor’ whose nearest experience to coal was to use the electricity generated from a coal-fired power station. Labour’s problem stems from its earliest days, when, short of funds, the Party voted to accept political donations to help get its men into Parliament. There was one judicial decision banning the funding of MPs by the Unions, and a further Act in Parliament to overcome this decision, and thus allow Unions funding of the Party, and its MPs. So we now see the situation where the People elect and pay a Labour MP, but he or she is funded and indeed supported by a Labour Union. The question then arises; to whom does he or she or she give his loyalty? To the Party whose banner he or she stood under when canvassing for, and gaining votes, and to his Constituency; or to the Union whose creature he or she has become, because of the vast financial support these same Unions spread around? As a final query, and in an individual point, we must ask ourselves who’s creature is now the Deputy Leader of the Party. Once looked upon as a king-maker, he is reduced to a silent shadow of his former authority; whilst ‘singing’ the Party dirge, which consists of repeated chants of the Party’s leader’s name. And the Party which once commanded respect, if little else? What sort of a Party is it when a BBC reporter has to be given a bodyguard as she attended the Conference? The same Party which introduced the flying pickets which hounded staff who would not support a strike by another Union entirely? The same Party which supported the massed actions of the miners during that strike of 84-85? The same Party which, when in power in the Seventies, gave in time and again to the demands of those same Unions; because they knew that if they did not bend the knee to their paymasters; the Unions would quickly find someone who did. The young of today have not the benefit of a good memory, as the likes of my generation have. We can remember the bin strikes, with rubbish bags piled so high, and for so long; that the rats were thinking of paying rent; so good were the pickings. We can remember the power cuts, the three-day weeks, the impassive strike pickets who denied the very right to a decent burial, because they claimed it would mean crossing a picket line! Corbyn’s Labour may be in the swing right now, with the Hard-line Left of the Momentum faction powerful; but the Labour Party will regret that silly vote which empowered Corbyn, along with his Hard-Left Trotskyite ideals, of a pacificism which reeks of betrayal of everything which Britain has stood for for centuries, and of the regret which has brought the Deputy Leader of the Party to a literal irrelevance! This has been a busy week. Took the day flight to Heathrow for two days of pretty detailed meetings on behalf of a non-US customer with non US insurance companies. While trying to keep a deal in the US from falling apart. It used to be that when you were in Europe on business, you were out of touch. Not me bro. I called, texted, emailed, the guys in NYC / Bermuda / London as much as I would have done had I been at my office. But really early mornings, really late nights, and compartmentalization got all done, so all is fine. God bless the Iphone, productivity tool of the ages. Even over the Atlantic, I was negotiating stuff by email thanks to United Airlines wifi. No complaints, since I get to visit one of the world’s great cities, talk to impressive people, eat in good restaurants. I am taking the opportunity to stop off in Ireland for a couple of days before returning to the cauldron. Today, I flew from London Stansted to Shannon via Ryanair. The flight was about 30 minutes late, which surprised me, since in my previous experience with them. they were ruthlessly efficient, always on time. Ryanair has been the subject of harsh criticism recently due to a large number of flight cancellations, apparently due to a pilot shortage or something. The British regulator claims that Ryanair has not told those who were booked on the cancelled flights what their rights were. Is Ryanair losing its mojo? I hope not. Despite their flaws, which include an unncessary pugnaciousness, they’ve saved every European traveler lots of money, even those who never fly them. I chose to pay extra fees for a better seat and for a checked bag, and my trip to Ireland was still a lot cheaper than what Aer Lingus, British or Cityjet would have charged me to get to Ireland. Say a prayer for Ryanair if you would. You don’t want to go back to the day when intra European travel was too expensive for the average person. 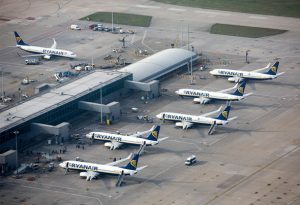 Ryanair busted up the old boys government airlines club. Long may it fly. Another week done at the coalface of capitalism. Have fun, whatever the weekend brings. The template is set in deepest Wessex, where I’m sitting with a beer, watching Newcastle vs London Irish. So have some of this. I learn that Giovanni Battista Pergolesi was a young man of 26 and dying of TB when he composed his Stabat Mater. That’s no age and a tragedy for music, but what a beautiful thing he left the world. I LOVE autumn for many reasons. One of them is that tingle of wood smoke on the nose. There’s nothing like it, no smell so evocative. My neighbour’s cottage is upwind of me, so I often get the benefit when she puts the fire on. Therefore I’m quite dismayed at the latest salvo against all that’s good. The Mayor of London is trying to restrict the sale and use of woodburners in parts of London. Of all the wrong-headed things. That place needs all the decency it can get. All laws are just the thin end of a ghastly commie wedge. If he gets his way the eco-loons will simply be encouraged. Wood smoke is the smell all our ancestors knew. It’s the smell of hearth and home, it’s the scent of domestic bliss, the whiff of civilisation. I’d sooner see central heating banned. Such beautiful, uplifting words. Imagine the type of person who disagrees with this. Well, the great National nightmare is over…….she is staying! They act like they have no idea ….On the other hand: desperate times call for desperate measures! Some state that our Judges are both competent in the area of sentencing; and of the need for Justice to be relevant: others disagree! Some Americans argue that their system of Government has all the oversight it deserves, others argue it has too much Partisan oversight! As Friday is upon us, my choice of music is perhaps subtly different, but still a great piece of music, performed by one hell of a singer. The film Gods and Generals was fair, but ruined by the five-odd minute long semi-religious soliloquies from the various generals. The movie ‘Gettysburg’ was fantastic, but Mary Fahl’s voice wins me over every time! The swarthy gent thought he was on somewhat safe ground as he replied ‘I’m a Palestinian Arab’. The instantaneous question again:- ‘Ah, but are you a Catholic Palestinian Arab, or a Protestant Palestinian Arab? Sadly, I read that even that small piece of humour is out-of-date; as I now learn that the Catholic Republican communities fly Palestinian flags, and the Protestant Unionists? They opt for the Star of David. Hundreds of prisoners, of various degrees of murderous inclinations, from both sides of a sectarian mindset border were freed, the Police were virtually neutered, and the politicking began; and that has never ceased. One side proposes, and the other side disposes in the political arena; and that has again continued for a long time. But certain propositions were both put forward and accepted; to many on the mainland these same proposals would have raised a forest of eyebrows: but Norn’Ireland has a logic and a manner all its own. Can any Englishman, home-grown or imported, expect, when being told that there is a Council House available yet unavailable; that they cannot live in that house, despite that house being both empty and available: because they are of the WRONG RELIGION? I have lived in my own home in a small estate in Durham City for over thirty-odd years, and I do not know what God any of my neighbours prays to, and nor do I really care! Its really a simple as that. Its none of my business! As long as they keep themselves to themselves, keep the noise down after ten in the evening, pay the rent if either private or Council tenants, only bother me when an emergency crops up: they’ll do me fine! 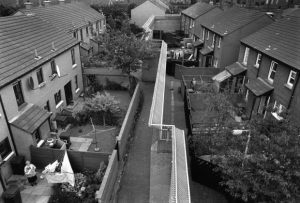 But we read of the quartet who used to live in Cantrell Close, a shared housing area off the Ravenhill Road. The Police arrived, presumably in force, and ‘advised the four families that ‘credible threats had been made by the UVF’ and those families ‘had to leave’. I would now point you towards a truly wonderful publication from the Northern Ireland Executive Office entitled ‘Together: Building a United Community Strategy’, and I would encourage you to read it all. 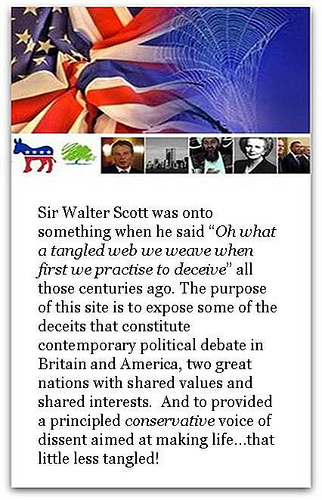 You will not learn anything from it, because as long as there are ‘credible threats’ from one group of shadows, and ‘equally credible threats’ from another; all those fancy phrases, all those wonderful ideas, all those high-flying theories about how we can crush the life out of ‘sectarianism’ if only we stand together; are simply not worth a bucket of piss! When even the ‘Strategy’ cannot be honest, and call hatred and true hostility what they are, what chance does the rest of that well-meaning booklet have of being able to tell those four Catholic families that they are safe, they can relax, because the Criminal GodFathers ON BOTH SIDES have been quelled? 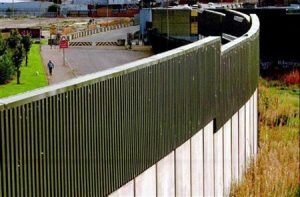 I wrote a few weeks ago of the dormant Assembly on ATW, and also on my own site and another, when discussing, for those who don’t understand what is so different about their NornIron fellow Brits, all about the cancer of the Peace Walls, those sadly mis-named excrescences which are so necessary to stop random bunches of thugs from one side of the sectarian fringe, to go attacking, burning and spreading their fear towards those on the other side of where that THIRTY FOOT-HIGH FENCE now stands, which comes along with reinforced steel netting, to stop the petrol bombs, the rocks and the rest. Politicians? I’ve shat better on a Saturday morning!